Who dreads going back to school more – the students or the teachers? Most likely the students, but that doesn’t mean returning to the school grind is easy on teachers. Aside from the seemingly endless preparations our teachers must make for the upcoming school year, they’re faced with the ongoing challenge of educating our kids with limited resources in ever-growing class sizes. But that’s what makes teachers so special; they’re everyday heroes committed to making a positive difference in spite of the challenges they face within our educational system. So, as we complain about back-to-school shopping, the cost of classroom supply lists, and the dreaded return of alarm clocks, let us remember that our struggles are only the beginning. 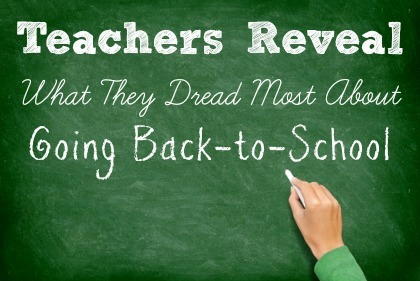 Let’s take a look at the things teachers dread most when it comes to going back-to-school.